Speaking a week after Italian elections that were tinged with anti-immigrant rhetoric and fed by widespread anger at low salaries and the lack of stable employment for young people, Francis drew attention to the fear that has also spread across Europe and the United States. “The Word of God has protected you in the past from the temptations of ideology, and today it delivers you from the intimidation of fear,” Pope Francis told the Sant’Egidio Community, an international lay community celebrating the 50th anniversary of their foundation in Rome. His homily was delivered at the end of a prayer service in the Basilica of Santa Maria in Trastevere, next to the site where the community was founded in 1968 by Andrea Riccardi when he was a high school student. Today there are some 50,000 members in a network of communities in 70 countries. From his time as Archbishop of Buenos Aires, Pope Francis knows their work with the poor, assistance to refugees and migrants and peacemaking efforts. As pope, he has received their leaders—especially Mr. Riccardi and Marco Impagliazzo, their president—many times in the Vatican. Francis spoke today after listening to testimonies from their founder and members of the community. Mr. Riccardi noted that unlike the time when the community was founded, “there is much anger” and violence in society today and they have to work to overcome this. “The world today is often inhabited by fear. It is an ancient disease”, but “the call not to be afraid often recurs in the Bible,” he said. Francis recalled that “when we are alone, we are easily the victims of fear” but he noted that the Sant'Egidio Community “directs you to look at the future together: not alone, not by yourselves, and together with the Church.” Their community was born at the end of the 1960s, and Francis highlighted the fact that they “have benefited from the great impulse to community life and to being people of God that came from the Second Vatican Council. 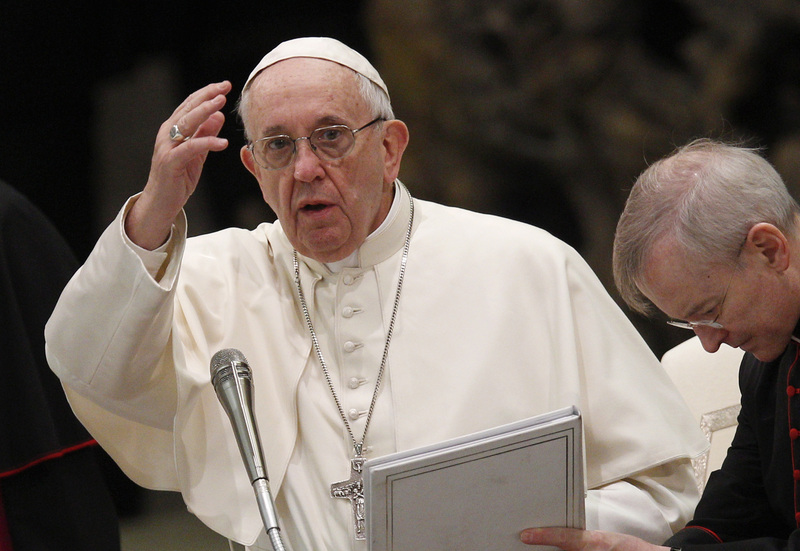 Francis pointed to “the sorrows of the Syrian people,” saying “the future of the world seems uncertain. Look at how many open wars there are!” He noted that the community had welcomed the Syrian refugees to Europe through the “humanitarian corridors” project that they started with other Christian communities. The future of the global world is living together and this ideal calls for the commitment to build bridges. I certainly believe in welcoming immigrants to our country. Some years ago, when I worked in a group home with disabled men, several of my co-workers were from Liberia, who had fled from a brutal civil war seeking a better life here. I commend the Sant Egidio Community for their prayerful work on behalf of people who are poor or refugees, especially refugees from the ongoing, horrendous war in Syria. Maybe the Pope should talk to the young women in Sweden, Germany and the UK. Just google "Rotherham". It will make your skin crawl. Then look up Rochdale and just last week Telford. In all local police tried to silence the victims. Maybe the Pope should be briefed instead of repeating platitudes. This whole idea of opening up your house to strangers is nonsense when the strangers have no concept of reciprocating and want to destroy you and debase you. Never a word about how many of those admitted are downright dangerous. This is why nobody listens to him. He just offers boilerplate language e.g. "build bridges", "dialogue", "diversity." It is not that simple. Europe is not taking in just the meek and the poor, which is fine. Open borders have enabled thousands of predatory young men. It doesn't fit Francis's rosy scenario. Maybe when he doesn't speak as someone living safely in the Vatican people will listen. Until then the everyday citizen has to deal with his and other elites' condescending sermonising. You can try to marginalize this Pope, as disturbing as that may be to other believers. You cannot marginalize the moral imperatives of the Gospel and the scriptures, including the Old Testament, of which he speaks. That is tantamount to rejecting your baptismal promises.